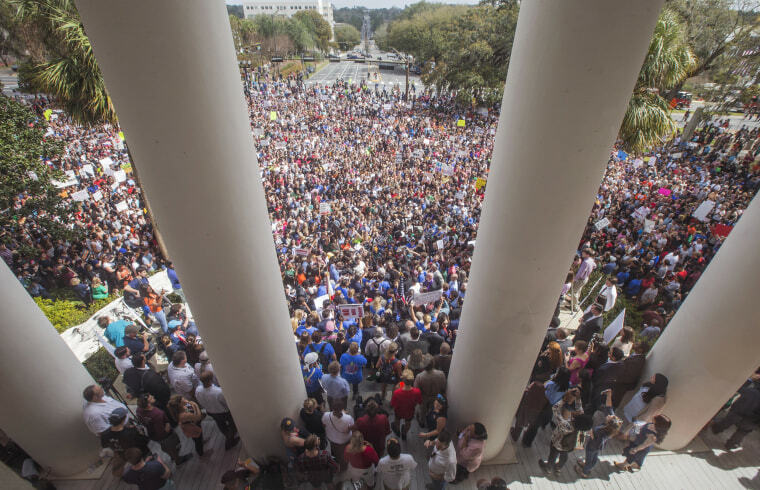 Thousands of students descended on Florida's Capitol in Tallahassee one week after the worst mass shooting at a high school in U.S. history. 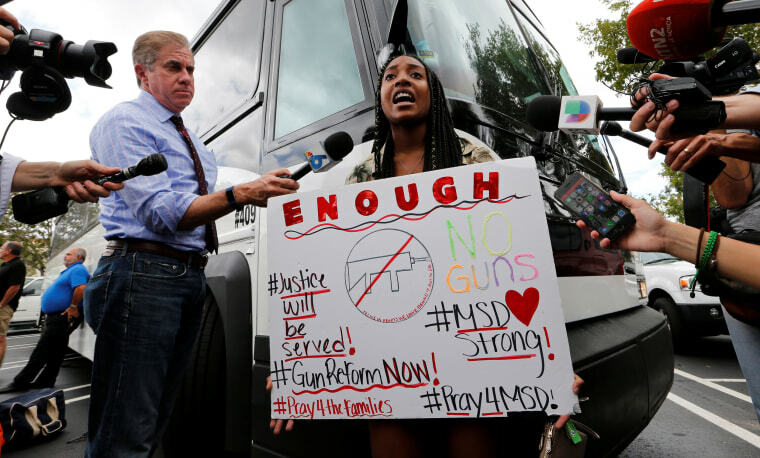 Tyra Hemans, 19, a senior at Marjory Stoneman Douglas High School, speaks before boarding a bus with other students to travel to Tallahassee on Feb. 20, 2018. 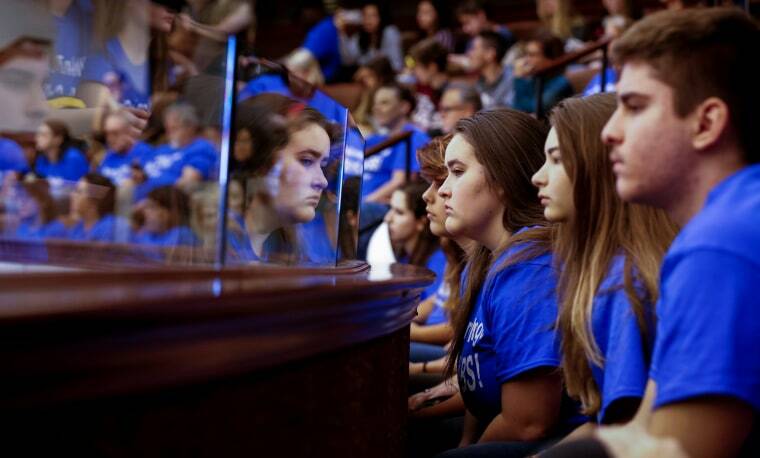 About 100 students traveled some 450 miles by bus Tuesday to the Florida capitol to convince state lawmakers the time for change is now, after 17 people were killed in a mass shooting at the high school. 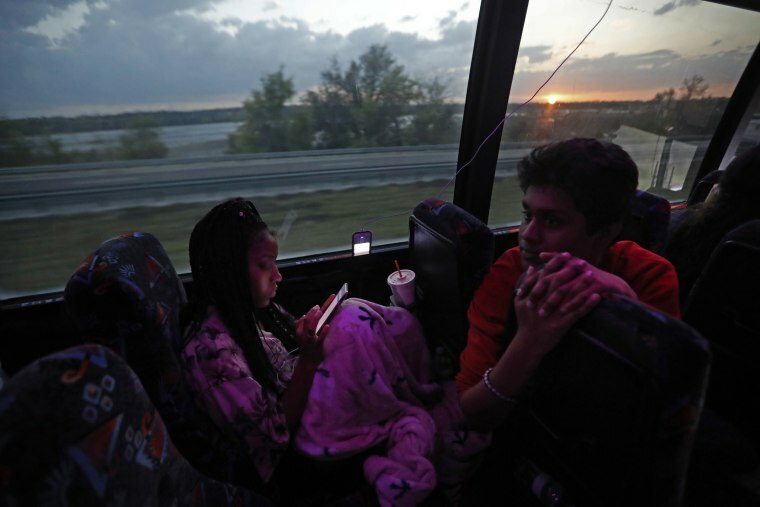 Tyra Hemans, 19, left, and Tanzil Philip, 16, speak on the bus on their way to Tallahassee. 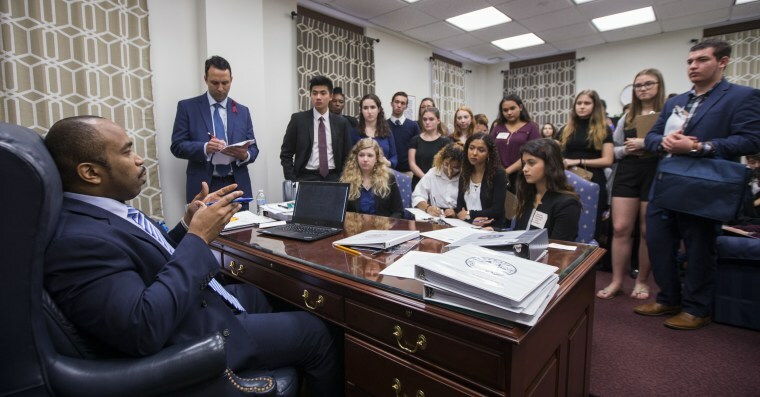 Sen. Bobby Powell speaks with Marjory Stoneman Douglas High School and other students from Broward County high schools in his office. 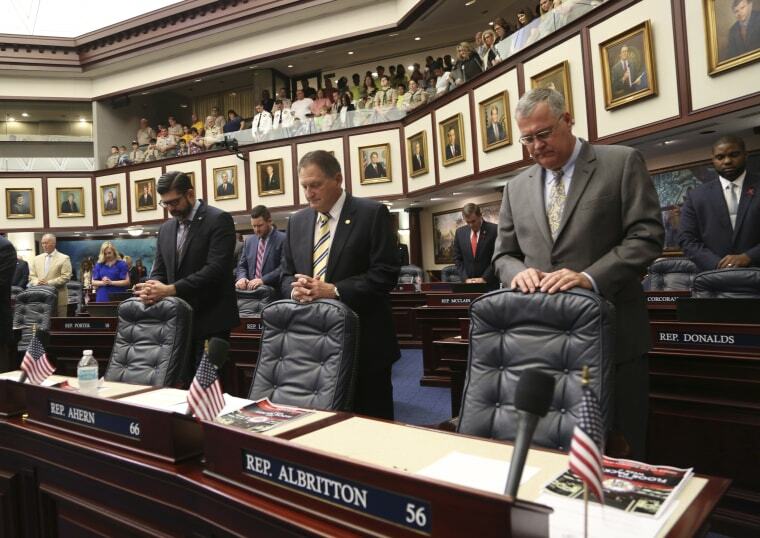 Florida House members Rep. Manny Diaz, Jr., R- Hialeah, from left, Rep. Larry Ahern, R- Seminole, and Rep. Ben Albritton, R- Wauchula, stand in silence with other members of the Florida House in memory of the 17 people killed at Marjory Stoneman Douglas High School. 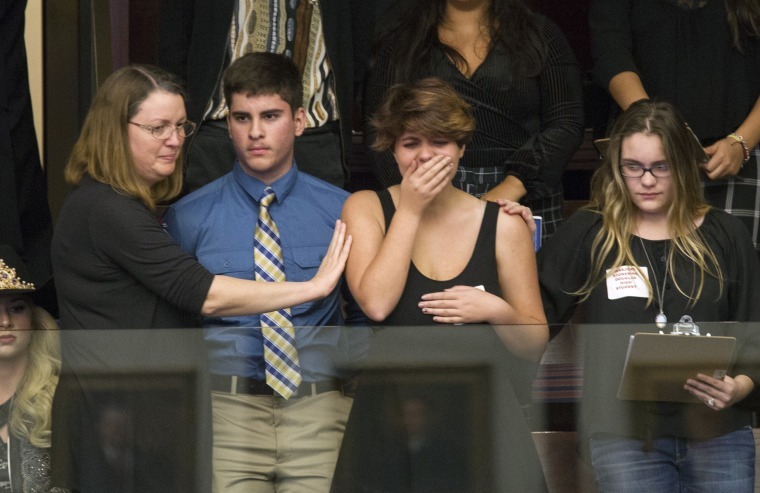 Sheryl Acquarola, a 16 year-old junior from Marjory Stoneman Douglas High School, is overcome with emotion in the east gallery of the House of Representatives after the representatives voted not to hear the bill banning assault rifles and large capacity magazines. 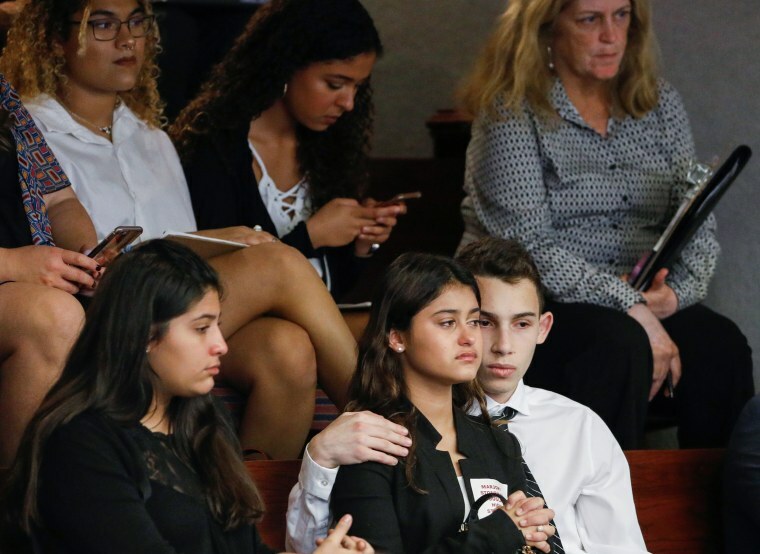 Students from Marjory Stoneman Douglas High School, and others there to support them, react after the Florida House of Representatives voted down a procedural move to take a bill banning assault weapons out of committee and bring it to the floor for a vote. 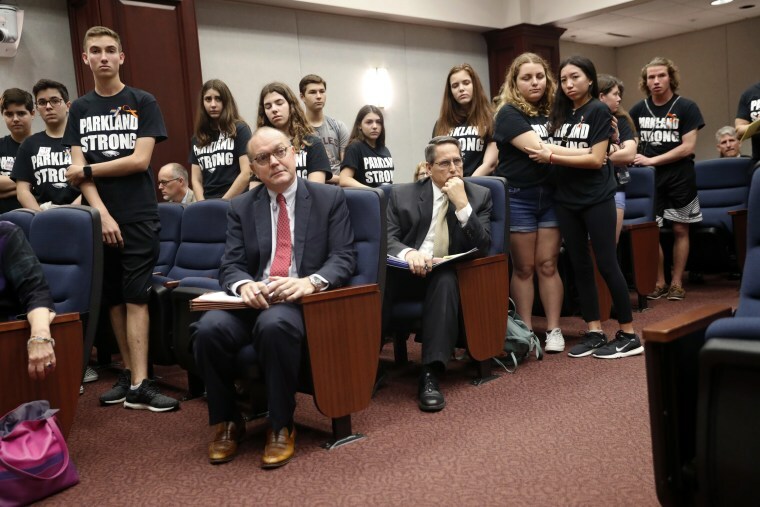 Lobbyists and attorneys listen as students from Marjory Stoneman Douglas High School interrupt a house legislative committee hearing to challenge lawmakers on gun control reform on Feb. 21. 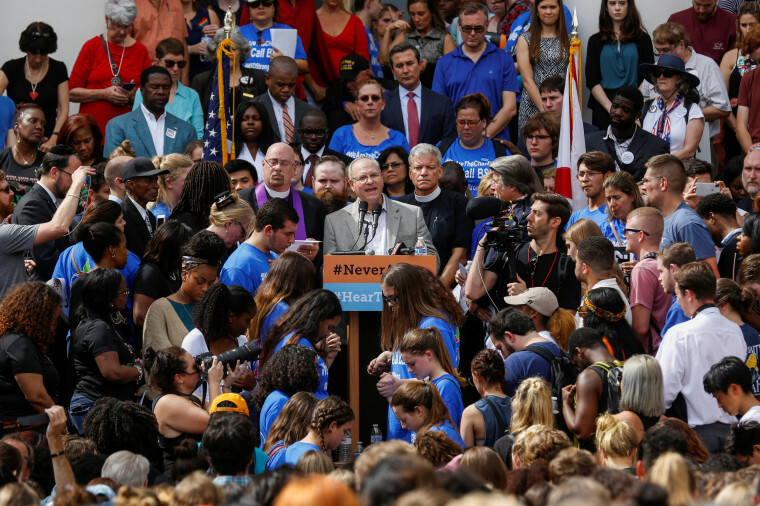 Protesters rally against gun violence on the steps of the old Florida Capitol. 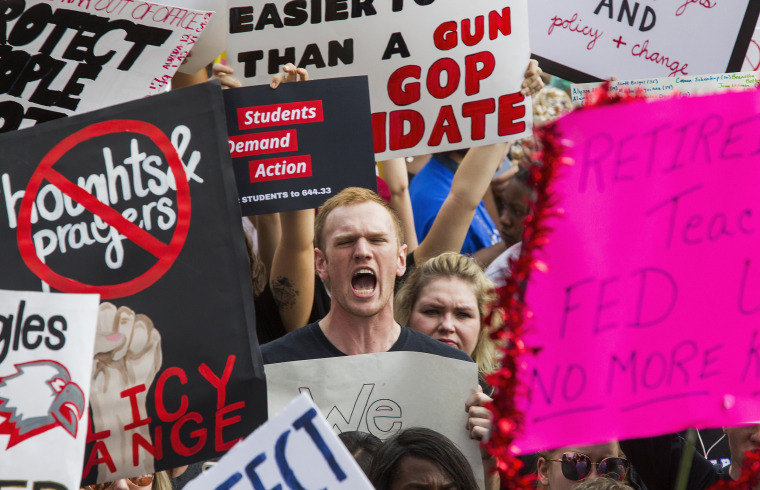 Students at schools across Broward and Miami-Dade counties in South Florida planned short walkouts on the one week anniversary of the deadly shooting at Marjory Stoneman Douglas High School. Rabbi Jack Romberg speaks at a rally outside the state Capitol. 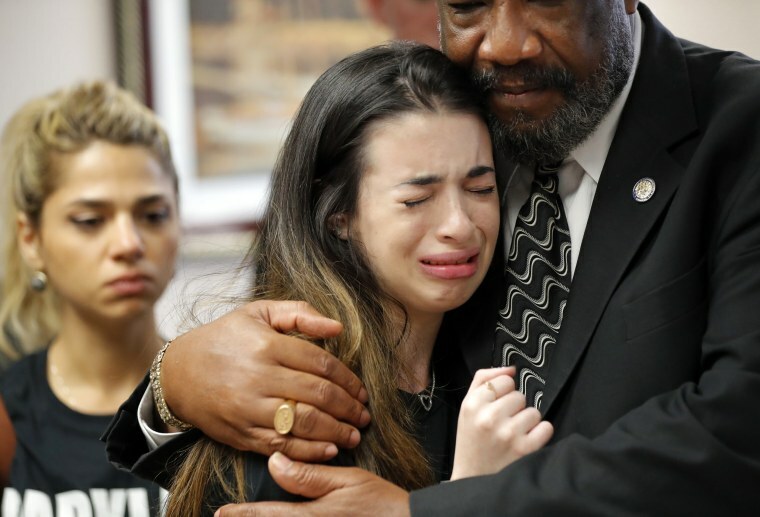 Aria Siccone, 14, a 9th grade student from Marjory Stoneman Douglas High School, cries as she recounts the day of the shooting, while state Rep. Barrinton Russell, D-Dist. 95, comforts her inside the state Capitol. 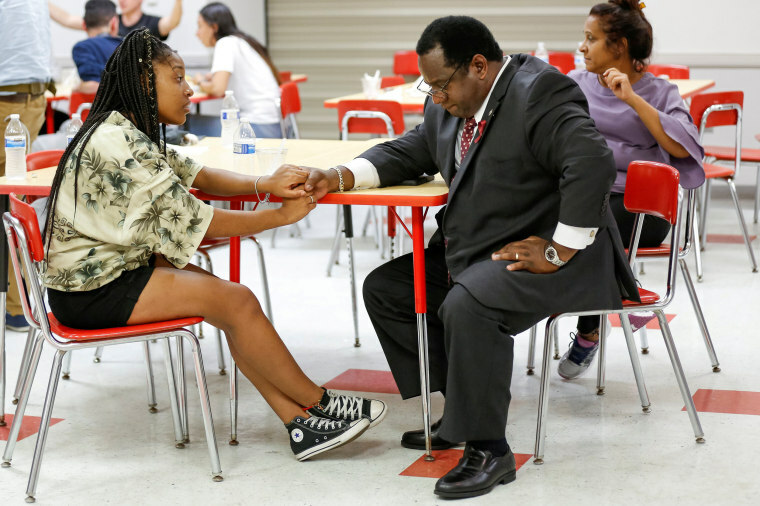 Tyra Hemans, a senior from Marjory Stoneman Douglas High School, speaks with Florida Rep. Wengay "Newt" Newton, D-St. Petersburg, during a meeting at Leon High School after the students arrived in Tallahassee on Feb. 20. 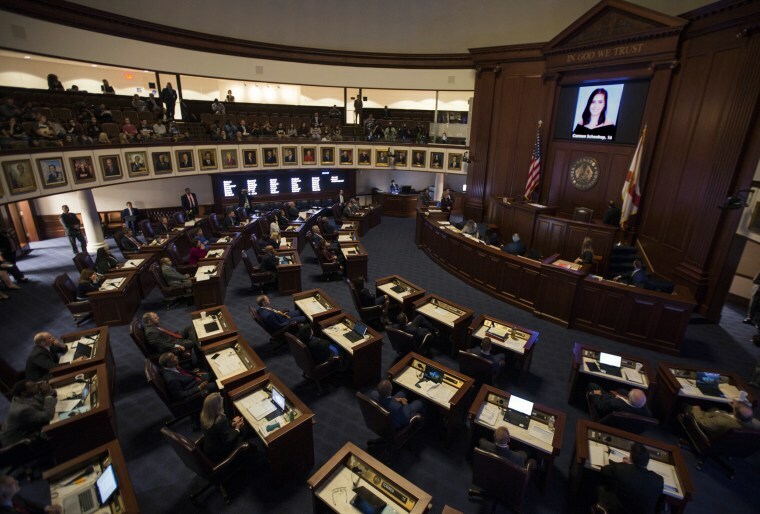 A slideshow of the 17 people killed at Marjory Stoneman Douglas High School is played at the state Capitol on Feb. 21. 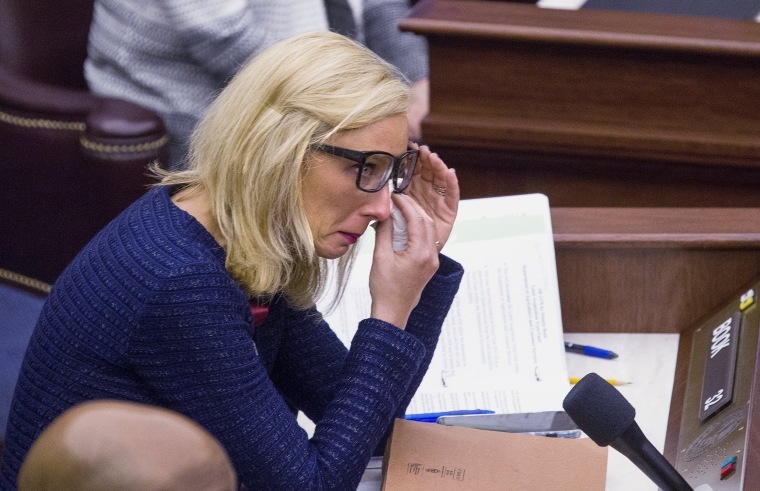 Florida Sen. Lauren Book, D-District 32, wipes her eyes after the memorial slide show. 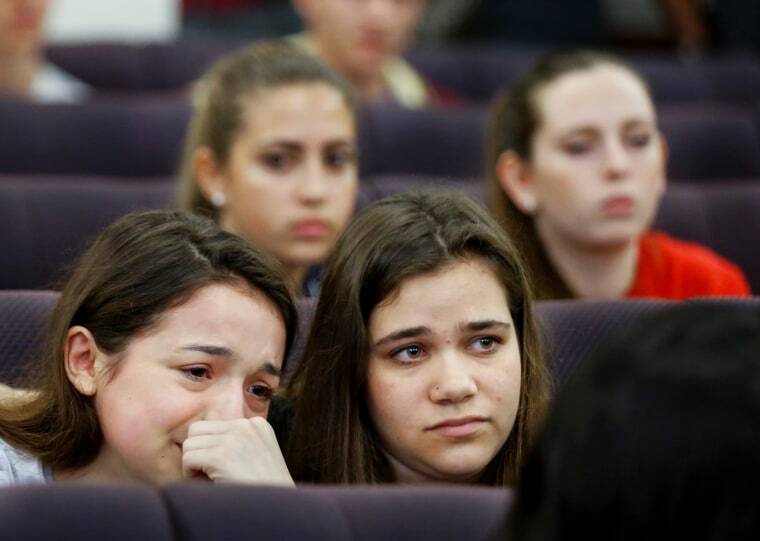 Marjory Stoneman Douglas High School student Alondra Gittelson, left, is comforted by schoolmate Bailey Feuerman. 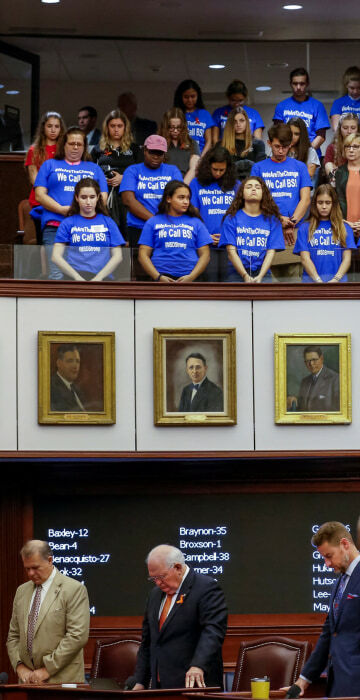 Students and their chaperones from Marjory Stoneman Douglas High School, wearing blue t-shirts, stand in the gallery above the Florida Senate as the Senate holds a moment of silence to honour the victims of the mass shooting. 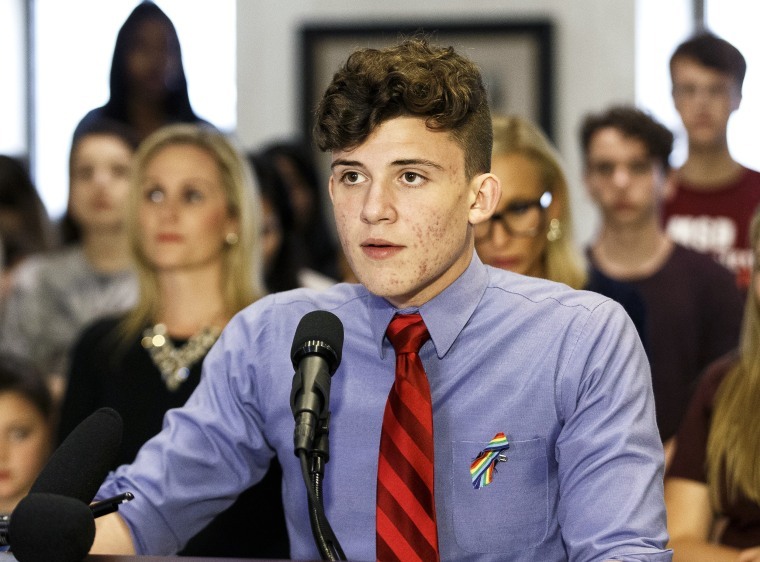 Kevin Trejos, a student from Marjory Stoneman Douglas High School speaks at the Capitol building. 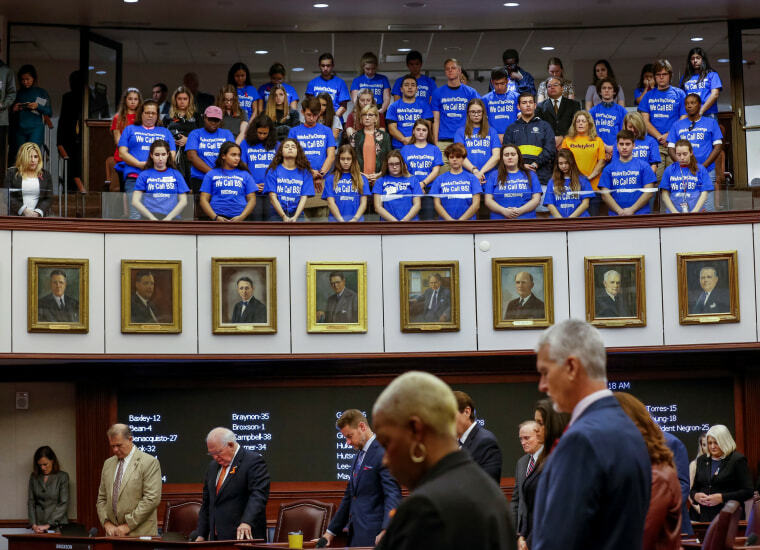 Students from Marjory Stoneman Douglas High School look on from the gallery above the Florida Senate after they honored the victims of last week's mass shooting. 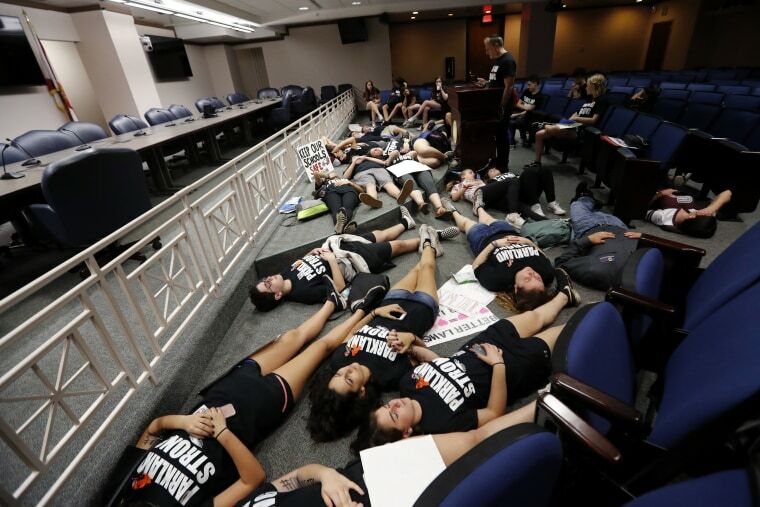 Seventeen students from Marjory Stoneman Douglas High School lie down on the floor in silence and pray at the approximate time of the attack one week ago, inside the state Capitol. The students, members of the Congregation Kol Tikvah Temple, lost three students. 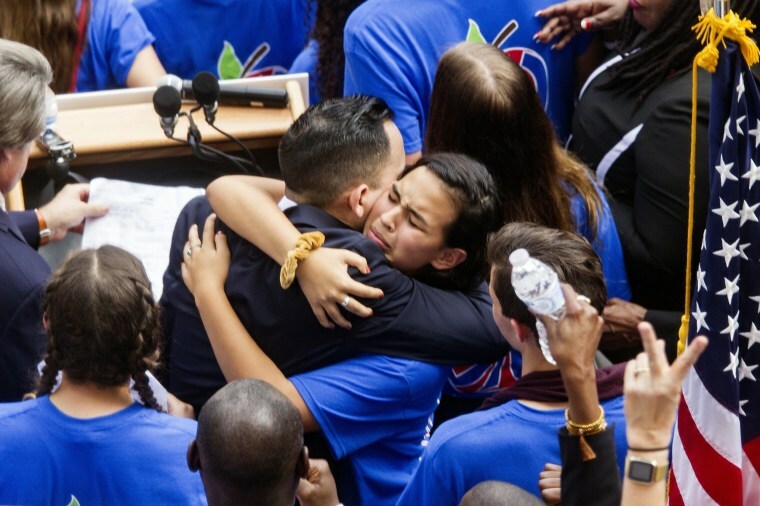 Victoria Mejai, a sophomore from South Broward High School hugs Florida Rep. Carlos Guillermo Smith after he spoke at a rally against gun violence on the steps of the old Florida Capitol in Tallahassee, Florida on Feb 21.